This giveaway is now closed. Our winner is Lisa Renata. Congratulations!!! The following review was written by Silvia, mom of two bilingual sons ages 5 years and 18 months. You can catch up with Silvia blogging at: Mamá Latina Tips. The Bilingual Fun Company was created with the purpose of exposing young children to the Spanish language. Mark and Jennifer Manriquez use their knowledge and experience both as educators and as bilingual parents to create these videos with music, chants, movement and basic activities that make learning Spanish fun. My children enjoyed watching the videos; my 5 year old sat focused while my 18 month old couldn’t stop dancing to the music. 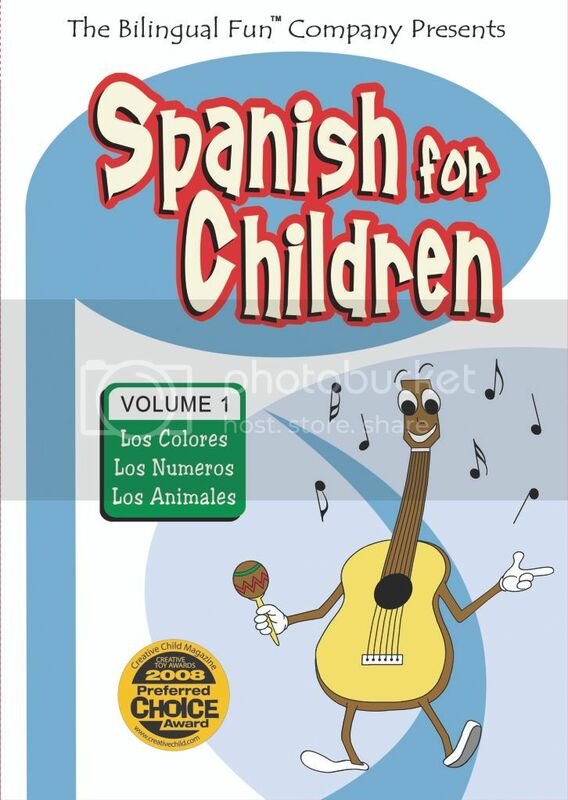 Spanish for Children Volume 1 covers “Los Colores (Colors),” “Los Números (Numbers),” and “Los Animales (Animals)”. 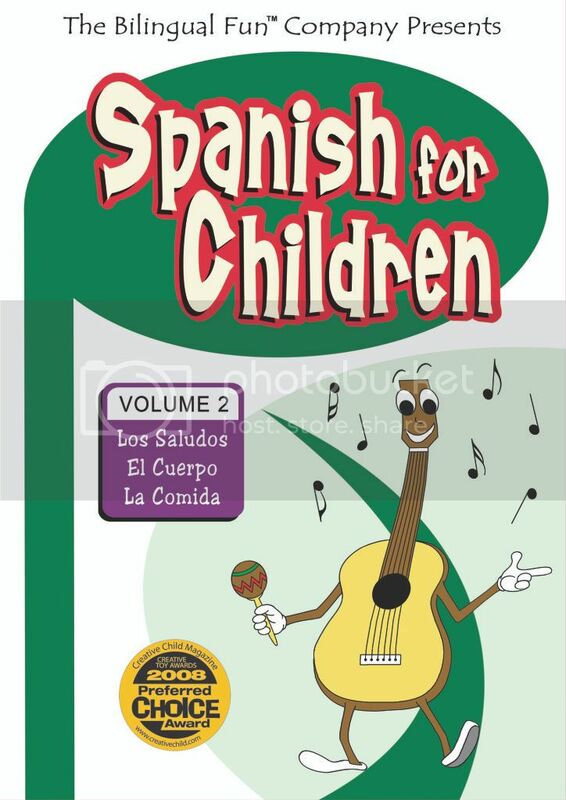 Spanish for Children Volume 2 covers “Los Saludos (Greetings),” “El Cuerpo (The Body),” “La Comida (Food),” plus a practice quiz. Both videos are for children 1-10 years of age and come with vocabulary and lyrics to follow along. The videos are designed so that each chapter has at least one group activity, one song, pictures and subtitles. Repetition is key to learning a language and the videos use this tool very well, changing locations and objects to reinforce the words. I also like that you can watch all chapters together or you can choose just one (this comes in handy when you have a child who loves one and wants to watch it over and over again). My 5 year old, who is bilingual, knew pretty much every word, and still he was very focused on the video, he danced and sang and participated with the activities. He just started reading in Spanish and reading the subtitles gave him a lot of pleasure, too. My 18 month old enjoyed the music, he clapped and danced with it, and while he is still too young to focus for the duration of the video, he perked up when the children appeared, especially during the songs. The singing was fun, not always completely in tune to be honest, but this just gives it an authentic charm. Children love to sing and dance and the videos have plenty of that. A couple of the songs I remember singing myself as a child in Mexico, so it was fun to hear them again and to be able to share them with my own children. I wish they had used “Por Favor and Gracias” a little more. However, overall, I think these videos would be great for both parents who speak English only and want to introduce Spanish to their children, and for Spanish-speaking, bilingual parents or OPOL families who want to have something fun for the kids to watch while reinforcing Spanish language learning. 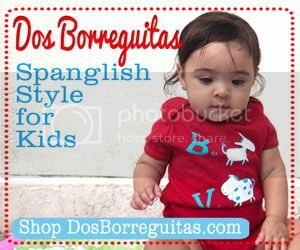 Your kids will love them and you will love listening to their Spanish grow. Jennifer Marquez, or Maestra Jen, a fellow mamá bloguera and owner of Bilingual Fun is giving one of our readers the two DVDs in the award-winning Spanish for Children series. All you have to do for your chance to win is head over to the Bilingual Fun website and then come back here and tell us one thing you learned about teaching Spanish to your children. That´s it! 1. Blog and/or tweet about this giveaway or about our whole week of Bilingual Summer Fun giveaways. Please leave an additional comment with the link. 2. Subscribe to our feed via email and leave us an extra comment letting us know you did so. Make sure to leave the comment using the same email you subscribed with. And please do verify the subscription once you receive the email to do so. We will check in order to validate the entry. 3. Subscribe via RSS. Once you do, or if you’re already a subscriber, email us the “Secret Phrase” at the bottom of the post to: giveaways@SpanglishBaby.com. 4. Become a fan of our Facebook page. Leave us another comment letting us know you did so. This contest will close tonight at midnight PST…so don’t hesitate and enter now. It could be yours!!! Make sure you come back tomorrow and the rest of this week for more Bilingual Summer Fun giveaways! 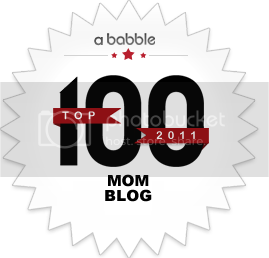 I checked out their blog and am adding it to my favorites. I don’t speak much spanish but my husband does, and husbands don’t always know all the cute little songs kids love. I need all the help I can get. Thanks. .-= Amanda´s last blog ..Take me out to the ball game! =-. I need to make learning spanish more fun for my kiddies… would love to win this!!! I never thought about active movement as a way to learn Spanish. Great idea! Raising my kids OPOL is not as easy as I though, but one thing that I didn’t necessarily learn new, but agree with a lot- is that learning should always be fun and an everyday process. I will also be posting about your giveaway on my blog. .-= Lisa Renata´s last blog ..Simple pleasures :: Placeres sencillos =-. I can speak firsthand as to the quality of Bilingual Fun Company’s classes and programs! Having adopted two boys from Guatemala my husband and I are making bilingual education a top priority. My oldest boy (3-1/2) has been in their classes for a year and will attend their summer camp program in August. My youngest (2) just completed his first term of toddler spanish. What we’ve learned so far is the value of repetition. We play each class audio CD every day over lunch and our boys’ language retention is amazing! We couldn’t be more pleased! Thank you for highlighting Bilingual Fun Company and founders, Jennifer and Mark! I like the suggestion to teach Spanish through music. The idea to teach Spanish through movement sounds fun. I learned “Research continually supports the benefits and advantages of teaching kids Spanish and other languages at a young age. ” Thanks for the great giveaway! .-= Chrysa ´s last blog ..Chex Mix Bars – Review and Giveaway =-. .-= Chrysa´s last blog ..Chex Mix Bars – Review and Giveaway =-. I will be homeschooling my children this coming Fall. With all that comes with Homeschooling, Curriculum is of utmost importance! I’ve been looking for a program to teach my children, originally thinking something like a workbook and flash cards. Well, while trolling through the site Bilingual Fun, I found “5 Tips for Teaching your Child Spanish at Home”. This article is packed with ideas and information on teaching Spanish in a fun way. Never did it cross my mind to do it hands on! Playing songs, games, and twisting popular American games into Spanish lessons sounds like so much fun! I think that my kids and I would enjoy doing that and flashcards for review, and books of course. Instead of the workbook idea. Thank you SpanglishBaby! .-= Erika Salazar-Drain´s last blog ..Teaching Spanish/Ensenando Espanol =-. A baby’s brain is like a computer waiting to be programmed. With billions of neurological connections possible, experts suggest that a baby’s pliable brain offers certain advantages for learning a second, or even a third language. that introduces Spanish to kids 3 to 5. Thanks for having amazine resources, information and great giveaways! Childhood is the best time to teach a second or third language because their brains are much more pliable and receptive to learning those skills. Thanks for hte great contest! I learned that the widest window of opportunity for language development exists between the ages of 0-60 months when language and cognitive skills are beginning to develop. I learned that my children might learn spanish quicker using music. We have been on and are planning other mission trips ourselves but now we’d like to take our 5 an 6 year olds. This would be a great way to introduce them to the language. The most useful information I learned is “The widest window of opportunity for language development exists between the ages of 0-60 months when language and cognitive skills are beginning to develop. I need to be talking to my 8 month old Spanish starting now. I subscribed to your feed and emailed your secret phrase. I am now your Facebook Fan! 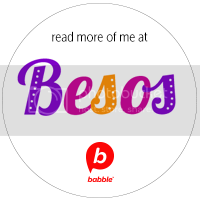 loved the tips on being bilingual at home…reading, movement, music, keeping it realistic, and keeping it fun…I’m adding you to my blog! .-= Susan´s last blog ..family nights =-. I thought it was interesting that they incorporate physical movement in their videos since active learning is supposed to be helpful for children learning. I checked it out and found a cute worksheet to learn names of insects. Thanks. .-= Gingerannbeck´s last blog ..Day of the Child and Book Giveaways =-. I blogged about your giveaways at teachinggenerations.blogspot.com. Love her 5 tips for teaching Spanish at home. Even though I teach Spanish at school, I don’t use it at home like I should! I learned that teaching Spanish through movement is a good way to learn. It makes sense though I will have to try it. .-= Kelly K´s last blog ..The conversation =-. I learned that fluency, pronunciation, and comprehension are reinforced by singing. Learning through movement. This would be learning through dancing or games. One game I like to use to teach colors and left and right in Spanish is Twister! .-= Gigi´s last blog ..Summer Traveling – Will return in 10 days! =-. I love your blog and have subscribed! I so glad I found it. I teach Spanish to my kids at home and I am always looking for support materials! I like the suggestion of learning Spanish through song. My daughter Danielle is learning Spanish and would love to win some thing thats fun! i learned from the Bilingual fun website that it needs to be fun for preschoolers, that I shouldn’t worry about pronounciation, and that research shows that children who receive second language instruction are more creative and better at solving complex problems. Thanks for the website with great links and lessons! The widest window of opportunity for language development exists between the ages of 0-60 months when language and cognitive skills are beginning to develop. quote it is for children 1-10 years of age …I want to learn too. I hail from a latin family that refused to teach their kids spanish, and it pains me in some way everyday. Teaching my children from a young age is the way to go! Your specialty programs include: birthday parties (very cool), camps and more. From birth to about age eight children learn other languages without prejudices or inhibitions. Thank you for the opportunity to participate in this giveaway!